Indian Railways is galloping on the developmental track; the stable government at the center has already announced in the railway budget that it intends to transform the railways from inside out with offerings like bullet trains. The Railways is embracing technology, getting funding, and setting up committees to monitor the developmental work that is being planned and executed across different parts of the country. Hundreds and thousands of workers are working day in and day out to bring Railways’ dreams to life. The Railway authorities have also ensured that the workers are exposed to best work methodologies and are adequately protected. Besides helmets, they are provided with high quality safety footwear so that they can go about their work with the least concern for their safety. 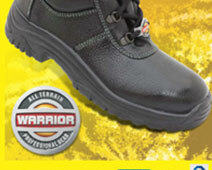 This is exactly where Warrior industrial safety shoes come in to the scene! Built in state-of-the-art facilities, Warrior industrial safety shoes in India are built using genuine leather and direct injection P.U. soles. The front portion of the shoes is provided with extra strength with steel top caps so that the workers’ toes don’t get injured when something heavy – such as a stone – falls on or rolls over their toes. 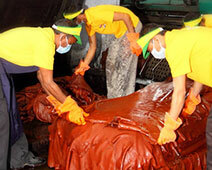 The shoes are also designed to be comfortable and light weight so that the workers can work all day, and still do not end up with sour or aching feet. The shoes also last long since high quality materials go in to the making of these shoes. Besides meeting the demand of Railways, the shoes are also exported to numerous other countries for different industries which require high quality protective footwear.